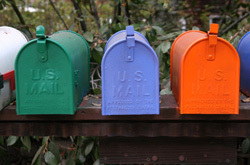 The USPS® estimates the cost of Undeliverable As Addressed (UAA) Mail at almost 2 billion dollars per year. That represents almost 10 billion pieces of mail. How much of that undeliverable mail belongs to your organisation, and how much is it costing you? 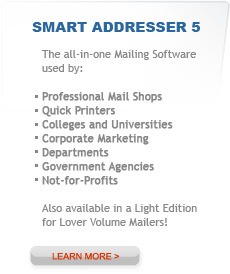 SmartSoft offers two mailing list management software solutions that are both PAVE™ and CASS Certified™ and that save our customers hundreds of thousands of dollars in postal discounts every year, bringing ZIP+4 accuracy to their customer databases with Delivery Point Validation (DPV), drastically lowering their undeliverable mail, and earning them valuable postal discounts at the same time. 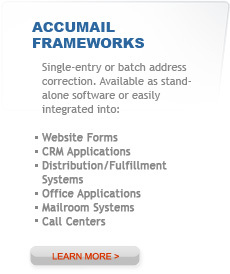 AccuMail frameworks Mailers Edition is also available in a LIght Version for lower volume mailers. To compare all of our mailing software products, take a look at our Mailing Software Comparison Chart. Trust SmartSoft postal software to keep your data accurate and your mail prepared correctly every time, saving you time and saving you money.